When we started getting requests to branch out and cover artisan lifestyles, we wanted to be sure that any new section on our website reflected our ethics of money not changing hands, helping small businesses, recycling, and an appreciation of nature – and so the upcycling bloggers at Pumpjack and Piddlewick were the wonderful people that sprang to mind to start this lifestyle blog for us. If you have always wanted a garden but are lacking in space, or simply have a vertical space that you wish do to something with, I can highly recommend planting vertically. We are lucky enough to have an old-fashioned terraced vegetable garden that we manage. As newbies to gardening (we are just one year in), last winter we got over-ambitious and planted more than 56 varieties of veg. Consequently, as we need as much planting space as possible, we decided to try our hands at making a selection of different types of planters, from raised beds to making planters out of pallets, to see what would work best. In conjunction, we also had a rather large collection of plastic milk bottles. 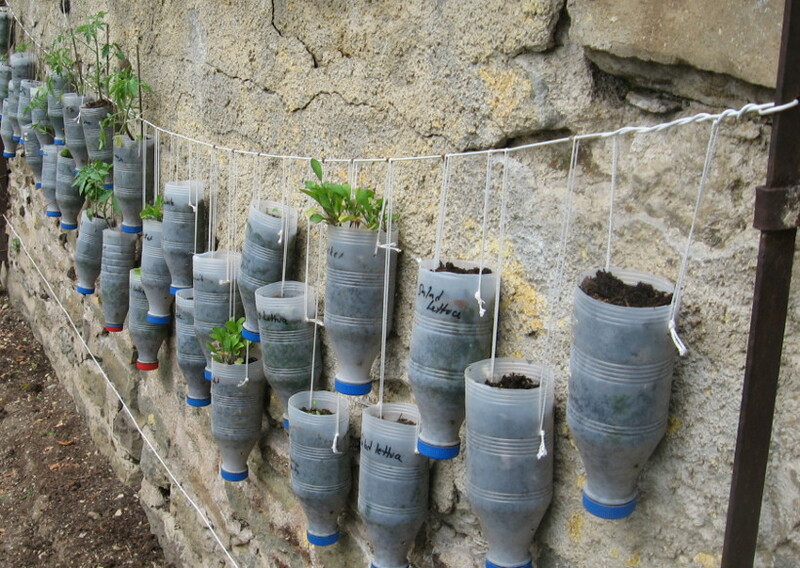 It seemed a waste to simply throw these away, so with the internet at our fingertips, we came across multiple ways of re-using them, one of which was a hanging garden. So, we added another possibility for planting our many planned veg. Since we had two blanks walls available, one of which had been previously used for espaliering, we decided to use this space to create a vertical and horizontal hanging bottle garden. 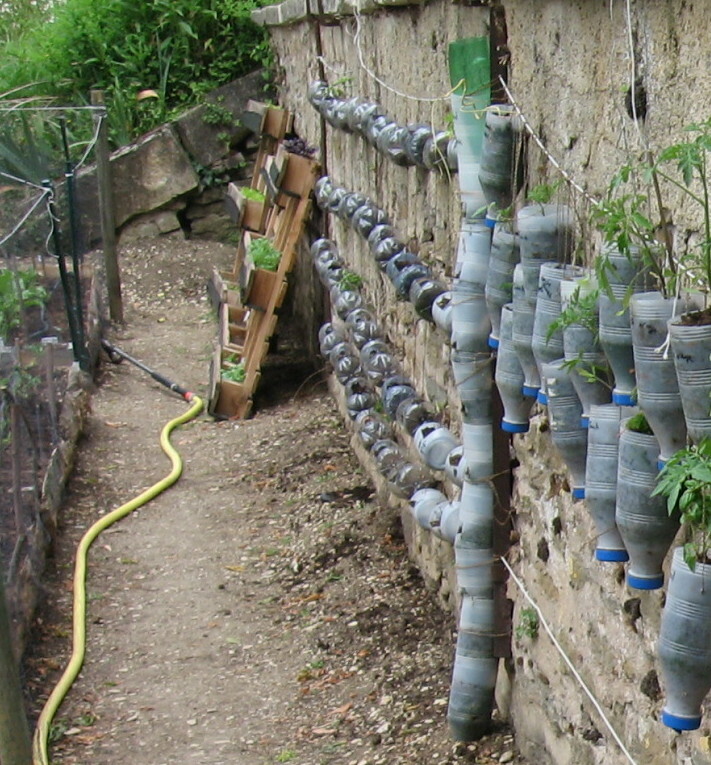 The essential difference between a vertical and horizontal hanging garden is the way in which the bottles hang. The horizontal bottles is aesthetically more pleasing to the eye and also allows for more bottles and thus plants. However, the vertical version gives more space to the plants. We opted to try both to see which one worked best. The how to~ We strung wire across for the initial support and on which we would hang the bottles. For the vertical bottles, we then cut the tops off the bottles, using a sharp knife. (Scissors worked alright, but was definitely more difficult, though ultimately safer.) We then drilled holes; 2 near the top that we could run string through for hanging, and 2 at bottom, for drainage as the bottle caps were left on to keep the soil from eroding away. To hang, we simply strung the string through the top holes and tied it over the supporting wire, filled the bottles with earth and added a plant or seeds. For the horizontal version, we drilled holes in the same configuration, but then instead cut out a section of the side of the bottle, rather than the end. We ran string through either end of the bottle, hanging on the support wire, and then planted a plant, or seeds, in the cut out section. With time, and a very sunny summer, we realised that the horizontal variation was not as good a system as the vertical one. It did not allow for as much root growth and dried out a lot quicker, which meant more watering was required. So this year, we have changed all our horizontal bottles over to vertical ones and transplanted our strawberries (from our pallet planters) into these to move them up and out of the way of chicken temptation. A vertical garden can also be hung inside. I have seen rods run through bottles, effectively stacking them and garden material or felt used to make pockets that are then battened to a wall. In fact you can buy garden pockets to hang inside or out, if you prefer this to making your own. So there is no more excuse to a ‘lack of space’ when it comes to the opportunities to grow your own herbs or veg. Rather, its just a matter of choosing which method you prefer to use.